Some days ago I received an inquiry from the heavy lift manager of an Australian crane hire company. He was asking me for details about how to setup a CAD based crane lift plan for his company. The largest and most respected crane, rigging and transportation companies achieve their reputation through their great people, their wide variety of well-maintained equipment and their ability to project a safe, competent and professional image to their clients. The first impression most clients have of their vendors is the paperwork they receive at time of bidding and the subsequent documents that are submitted as part of a lift plan or other prequalification documents. While it is quite possible to prepare a fully detailed and comprehensive plan with a word processor and hand drawn sketches, the apparent precision and professionalism of drawings prepared using CAD cannot be understated. In this article, we are going to look at the software, hardware and personnel requirement required to set up a small drafting office, fully equipped to import and output 2 or 3D Lift plans. To ensure compatibility and access to pre-drawn CAD “Blocks” we recommend AutoDesk Products. There are cheaper CAD products available, but which ever you select they should be able to open and edit .DWG and .DXF file formats. Many requirements of a lift plan such as simple rigging calculations can be automated using a spreadsheet program. An investment in an “office” program is therefore recommended. Not essential, but useful is a PDF conversion program. Converting high quality PDF files to a CAD format can save hours of drafting (or tracing) time and result in a more accurate plan. A good PDF print driver should be installed as many drawings can be output to PDF format directly and emailed to the client. The better packages allow “signature stamps” to be applied, and this means that the output quality of your drawings is not compromised by printing, applying signature approval then scanning back into the computer. Most modern desktops and higher end laptops are capable of running CAD software. While there are specialist CAD computers, for the relatively simple drawings you will produce, a good rule of thumb is to look for computers that considered “gaming” machines. You should always purchase a minimum of 8 GB of RAM, and the best video card your budget allows. The computer should also be able to support a minimum of two monitors. The huge increase in convenience and productivity provided by multiple displays is well worth the small additional cost. A monitor size of at least 24” should be considered, and no less than a 15” screen on a laptop. A desktop monitor can be paired with a laptop to give a larger primary drawing area. For 3D drafting, and possibly animation, a much better class of machine is required. Again, higher end gaming machines can be used, but custom machines with professional grade components should be considered for maximum productivity. A good printer and scanner are essential. Both printer and scanner should be able to handle 11 x 17 or A3 paper. Plotters and large format scanners are available, but are generally unnecessary for crane lift plan purposes. (A useful tip is that often drawings can be transmitted to printing/shipping shops for large-format output, and then delivered direct to your client). Any CAD system is only as good as its operator. There are two approaches here. One is to take whoever currently prepares your lift plans and arrange for them to have CAD training, or you can hire an experienced draftsman and have them work at the direction of an experienced lift planner. In the second case, the draftsman will learn the specifics of crane and rigging layouts and eventually be able to work with little or no direction. In my opinion the first option is preferable as typically a well produced set of lift drawings are reasonably easy to produce, whereas the experience required to produce a safe and comprehensive lift plan takes years of experience. On a side note, it can also be a good investment to give other members of your team the ability to use CAD. 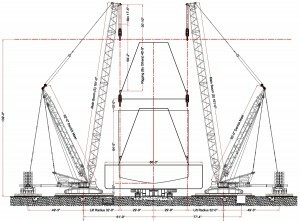 While the drawings may not be suitable for submittal to the client, it will help them greatly day-to-day in crane and equipment selection for bidding purposes or producing conceptual layouts. For a CAD based planning system to be effective, it is vital that a complete library of your company’s equipment as pre-drawn CAD “blocks” is available. This would include machinery (cranes, transport) and ancillary items such as rigging tackle components and architectural details etc. While some companies have their equipment drawn into CAD by their own draftsman, it is a very lengthy process and it is often difficult to get all the right details. A sound alternative is to have a custom library created, which will ensure accuracy and allow your draftsman / planner to focus on what’s important. 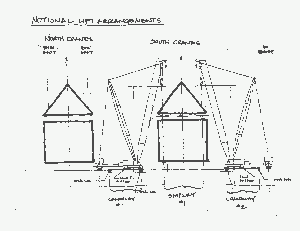 It should be remembered that the CAD skills required to accurately draw something as complex as a crane (and accuracy is vital) is very much higher than positioning pre-drawn “blocks” in a drawing and adding minor details such as hoist-ropes and architectural details. With the right set-up, an elegant, professional looking lift plan can be completed in minutes, and as a bonus, any changes to the plan can be performed in seconds. I hope I could give you a helpful insight on how to setup your CAD based crane lift plans. In case of any questions or remarks about this topic, please feel free to leave me a comment below. Steve has 22 years experience in the construction and equipment industry, and has used CAD for crane and transport operations planning since 1996. 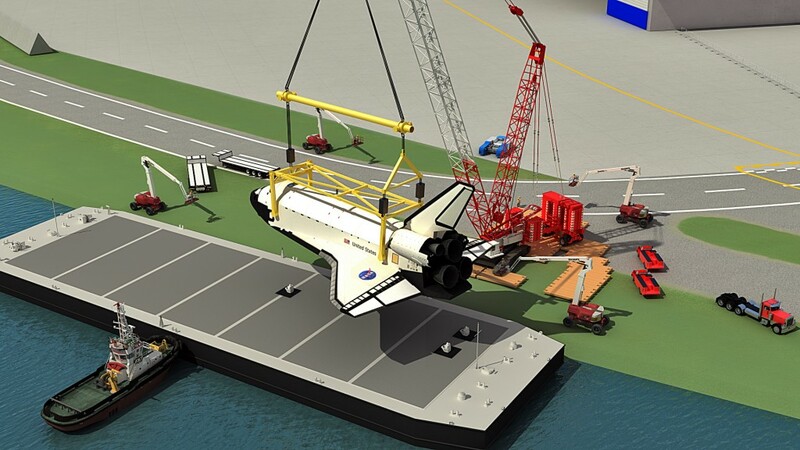 HLI Provides Heavy Lift & Transport Planning services, 3D simulation and specialist field supervision.